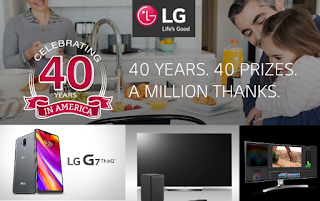 LG Electronics 40th Anniversary Giveaway - 40 Winners Win LG OLED TVs, LG G7 Smartphones, Monitors, Soundbars, Washer/Dryers, Refrigerators and More. Daily Entry, Ends 10/5/18. AWESOME PRIZES!!!!! GOOD LUCK! Entry Period 1 Prize: One (1) Entry Period 1 Prize is available to be won. Entry Period 1 Prize is an LG 4K HDR Smart OLED 55” TV with AI ThinQ®. The Approximate Retail Value (“ARV”) of the Entry Period 1 Prize is: $1,999.99. Entry Period 2 Prize: One (1) Entry Period 2 Prize is available to be won. Entry Period 2 Prize is an LG A9 CordZero™ Stick Vacuum.The ARV of the Entry Period 2 Prize is: $579.99. Entry Period 3 Prize: One (1) Entry Period 3 Prize is available to be won. Entry Period 3 Prize is an LG G7 ThinQ™ Unlocked mobile device.The ARV of the Entry Period 3 Prize is: $749.99. Entry Period 4 Prize: One (1) Entry Period 4 Prize is available to be won. Entry Period 4 Prize is an LG 4K Ultra-HD Blu ray Disc™ Player.The ARV of the Entry Period 4 Prize is: $179.99. Entry Period 5 Prize: One (1) Entry Period 5 Prize is available to be won. Entry Period 5 Prize is an6.2 Total Capacity TWINWash™ Bundle with LG SideKick™ and Dryer. Winner will have the option to select electric or gas. Prize includes set up of new items and haul away of old appliances.The ARV of the Entry Period 5 Prize is: $4,709.96. Entry Period 6 Prize: One (1) Entry Period 6 Prize is available to be won. Entry Period 6 Prize is an LG G7 ThinQ™ Unlocked mobile device.The ARV of the Entry Period 6 Prize is: $749.99. Entry Period 7 Prize: One (1) Entry Period 7 Prize is available to be won. Entry Period 7 Prize is an LG 34” Class 21:9 UltraWide® Fulll HS IPS LED Monitor with HDR 10.The ARV of the Entry Period 7 Prize is: $399.99. Entry Period 8 Prize: One (1) Entry Period 8 Prize is available to be won. Entry Period 8 Prize is an LG PuriCare Air Purifier Round Console.The ARV of the Entry Period 8 Prize is: $349.99. Entry Period 9 Prize: One (1) Entry Period 9 Prize is available to be won. Entry Period 9 Prize is an LG G7 ThinQ™ Unlocked mobile device.The ARV of the Entry Period 9 Prize is: $749.99. Entry Period 10 Prize: One (1) Entry Period 10 Prize is available to be won. Entry Period 10 Prize is an LG 2.1 ch High Res Audio Sound Bar with Dolby Atmos®.The ARV of the Entry Period 10 Prize is: $349.99. Entry Period 11 Prize: One (1) Entry Period 11 Prize is available to be won. Entry Period 11 Prize is an LG Styler Steam Clothing Care System.The ARV of the Entry Period 11 Prize is: $1,999.99. Entry Period 12 Prize: One (1) Entry Period 12 Prize is available to be won. Entry Period 12 Prize is an LG G7 ThinQ™ Unlocked mobile device.The ARV of the Entry Period 12 Prize is: $749.99. Entry Period 13 Prize: One (1) Entry Period 13 Prize is available to be won. Entry Period 13 Prize is an LG gram 15.6” Ultra-Lightweight Touchscreen Laptop wth processor with Intel® Core™ i7 processor and Thunderbolt™ 3.The ARV of the Entry Period 13 Prize is: $1,999.99. Entry Period 14 Prize: One (1) Entry Period 14 Prize is available to be won. Entry Period 14 Prize is one (1) LG 5.2 cu. Ft. Mega Capacity Top Load Washer with TurboWash™ Technology and one (1) LG 7.3 cu. Ft. Ultra Large Capacity TurboSteam™ Electric Dryer with EasyLoad™ Door. Winner will have the option to substitute a gas dryer. Prize includes set up of new items and haul away of old appliances.The ARV of the Entry Period 14 Prize is: $2,499.98. Entry Period 15 Prize: One (1) Entry Period 15 Prize is available to be won. Entry Period 15 Prize is an LG G7 ThinQ™ Unlocked mobile device.The ARV of the Entry Period 15 Prize is: $749.99. Entry Period 16 Prize: One (1) Entry Period 16 Prize is available to be won. Entry Period 16 Prize is an LG ThinQ® Speaker with Google Assistant Built-In.The ARV of the Entry Period 16 Prize is: $199.99. Entry Period 17 Prize: One (1) Entry Period 17 Prize is available to be won. Entry Period 17 Prize is one (1) LG 22 cu. Ft. Smart wi-fi Enabled InstaView™ Door-in-Door® Counter-Depth Refrigerator. Prize includes set up of new item and haul away of old appliance.The ARV of the Entry Period 17 Prize is: $2,299.99. Entry Period 18 Prize: One (1) Entry Period 18 Prize is available to be won. Entry Period 18 Prize is an LG G7 ThinQ™ Unlocked mobile device.The ARV of the Entry Period 18 Prize is: $749.99. Entry Period 19 Prize: One (1) Entry Period 19 Prize is available to be won. Entry Period 19 Prize is an LG Portable Bluetooth Speaker with Meridian Audio & Dual Tweeters.The ARV of the Entry Period 19 Prize is: $229.99. Entry Period 20 Prize: One (1) Entry Period 20 Prize is available to be won. Entry Period 20 Prize is an LG 2.3 cu. Ft. Compact All-In-One Washer/Dryer. Prize includes set up of new item and haul away of old appliances.The ARV of the Entry Period 20 Prize is: $1,699.99. Entry Period 21 Prize: One (1) Entry Period 21 Prize is available to be won. Entry Period 21 Prize is an LG G7 ThinQ™ Unlocked mobile device.The ARV of the Entry Period 21 Prize is: $749.99. Entry Period 22 Prize: One (1) Entry Period 22 Prize is available to be won. Entry Period 22 Prize is an LG 27” Class Full HD Gaming Monitor with FreeSync™.The ARV of the Entry Period 22 Prize is: $449.99. Entry Period 23 Prize: One (1) Entry Period 23 Prize is available to be won. Entry Period 23 Prize is an LG PuriCare™ 70 Pint Dehumidifier.The ARV of the Entry Period 23 Prize is: $299.99. Entry Period 24 Prize: One (1) Entry Period 24 Prize is available to be won. Entry Period 24 Prize is an LG G7 ThinQ™ Unlocked mobile device.The ARV of the Entry Period 24 Prize is: $749.99. Entry Period 25 Prize: One (1) Entry Period 25 Prize is available to be won. Entry Period 25 Prize is an LG 55” 4K HDR Smart LED SUPER UHD TV with AI ThinQ®.The ARV of the Entry Period 25 Prize is: $849.99. Entry Period 26 Prize: One (1) Entry Period 26 Prize is available to be won. Entry Period 26 Prize is one (1) LG 24 cu. ft. Door-in-Door® french-3-door-refrigerator. Prize includes set up of new item and haul away of old appliance.The ARV of the Entry Period 26 Prize is: $3,099.99. Entry Period 27 Prize: One (1) Entry Period 27 Prize is available to be won. Entry Period 27 Prize is an LG G7 ThinQ™ Unlocked mobile device.The ARV of the Entry Period 27 Prize is: $749.99. Entry Priod 28 Prize: One (1) Entry Period 28 Prize is available to be won. Entry Period 28 Prize is an LG full HD LED Smart Home Theater Projector with Built-in Battery.The ARV of the Entry Period 28 Prize is: $649.99. Entry Period 29 Prize: One (1) Entry Period 29 Prize is available to be won. Entry Period 29 Prize is one (1) LG 5.2 cu. Ft. Mega Capacity TurboWash® Washer with Steam Technology; one (1) LG Laundry Pedestal; and one (1) 9.0 cu. Ft. Mega Capacity Electric Dryer with Steam™ Technology. Winner will have the option to substitute a gas dryer. Prize includes set up of new items and haul away of old appliances.The ARV of the Entry Period 29 Prize is: $3,329.97. Entry Period 30 Prize: One (1) Entry Period 30 Prize is avaiable to be won. Entry Period 30 Prize is an LG G7 ThinQ™ Unlocked mobile device.The ARV of the Entry Period 30 Prize is: $749.99. Entry Period 31 Prize: One (1) Entry Period 31 Prize is available to be won. Entry Period 31 Prize is an LG 4K Ultra-HD Blu-ray Disc™ Player with Dolby Vision®.The ARV of the Entry Period 31 Prize is $249.99. Entry Period 32 Prize: One (1) Entry Period 32 Prize is available to be won. Entry Period 32 Prize is an LG G7 ThinQ™ Unlocked mobile device.The ARV of the Entry Period 32 Prize is: $749.99. Entry Period 33 Prize: One (1) Entry Period 33 Prize is available to be won. Entry Period 33 Prize is an LG 2.1 ch High Res Audio Sound Bar with DTS Virtual:X Sound.The ARV of the Entry Period 33 Prize is: $279.99. Entry Period 34 Prize: One (1) Entry Period 34 Prize is available to be wo. Entry Period 34 Prize is an LG G7 ThinQ™ Unlocked mobile device.The ARV of the Entry Period 34 Prize is: $749.99. Entry Period 35 Prize: One (1) Entry Period 35 Prize is available to be won. Entry Period 35 Prize is an LG G7 ThinQ™ Unlocked mobile device.The ARV of the Entry Period 35 Prize is: $749.99. Entry Period 36 Prize: One (1) Entry Period 36 Prize is available to be won. Entry Period 36 Prize is an LG 55” 4K HDR Smart LED UHD TV with AI ThinQ®.The ARV of the Entry Period 36 Prize is: $799.99. Entry Period 37 Prize: One (1) Entry Period 37 Prize is available to be won. Entry Period 37 Prize is an LG CordZero™ A9 Stick Vacuum.The ARV of the Entry Period 37 Prize is: $579.99. Entry Period 38 Prize: One (1) Entry Period 38 Prize is available to be won. Entry Period 38 Prize is an LG Portable Bluetooth Speaker with Meridian Audio & Dual Tweeters.The ARV of the Entry Period 38 Prize is: $229.99. Entry Period 39 Prize: One (1) Entry Period 39 Prize is available to be won. Entry Period 39 Prize is an LG PuriCare Air Purifier Round Console.The ARV of the Entry Period 39 Prize is: $349.99. Entry Period 40 Prize: One (1) Entry Period 40 Prize is available to be won. 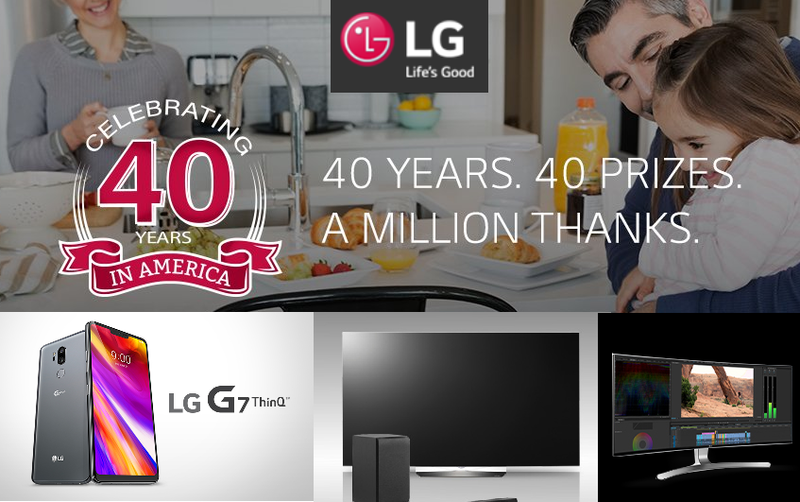 Entry Period 40 Prize is an LG product to be determined by Sponsor.The ARV of the Entry Period 40 Prize is: $999.99.